4) More convenient because of the frequency of trips provided by numbers of bus operators. To meet the high demands from passengers, various operators offer numerous and frequent trips for bus from Singapore to Kuala Lumpur. 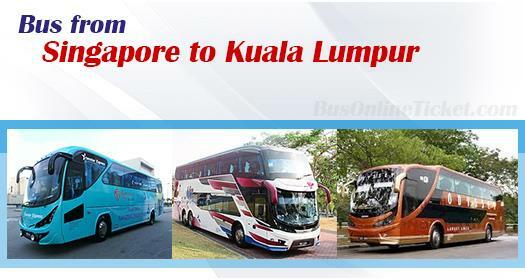 Popular bus operators for bus from Singapore to Kuala Lumpur include KKKL Express, Transtar, The One Travel & Tours, Grassland Express, First Coach, Starmart Express and many more. Almost all coaches would go through Singapore Tuas checkpoint and then enter Malaysia checkpoint near Gelang Patah. Passengers need to alight the bus without unloading their luggage at Singapore customs for customs clearance. After that, passengers board their bus again to proceed to Malaysia customs. At Malaysia customs, passengers need to get down again for customs clearance and unload their luggage for scanning. It usually takes about an hour from Singapore to post Malaysia customs. After Malaysia customs, it usually takes about 4.5 – 5 hours to reach Kuala Lumpur depending on traffic conditions, with 1 washroom break along the journey. The bus fare for bus from Singapore to KL ranges from SGD 10.00 – SGD 59.00, depending on the class of the coach. Causeway Link’s fare is at RM 122.00. Standard fare is usually at SGD 20 unless there is a special promotion. Passengers may not even feel like the journey is that long because the buses from Singapore to KL nowadays are well-equipped with fully reclining seats and air conditioning systems for passengers’ comfort during the journey. Some coaches even go one step ahead by offering personal TV system like Transtar Solitaire, Fivestar High Deck, First Coach, and Grassland Royal VIP. Another facility which is commonly offered is WiFi. At the moment, KKKL and Grassland coaches are offering WiFi onboard. This WiFi service is especially convenient for business travellers and youngsters who have no data roaming access during the journey to KL. USB charging ports are also available on KKKL and Transtar Solitaire. This is a great feature to have since passengers can conveniently plug in their mobile phones, laptops or digital cameras while onboard without needing to worry about their battery lives. Numbers of bus operators in Singapore provide the express bus to Kuala Lumpur, with departure points at various locations in Singapore. Passengers can choose the coach with the departure point which is most convenient to them. Most of the buses’ arrival points are at the newly-built bus terminal, Terminal Bersepadu Selatan (TBS). However, some bus operators do offer other options of arrival points like Berjaya Times Square, KL Sentral, Puduraya, Chinatown, One Utama etc. Passengers can choose the coach with the arrival point which is most convenient to them. Last but not the least, BusOnlineTicket.com also offers discounts every now and then for all their passengers as a form of loyalty and appreciation, no matter the pioneers or newbies. Thus, this makes BusOnlineTicket.com one of the most credible and reputed online booking portal among its customers throughout these years.